When we first meet Camille, she is writing a news story about a case of child abuse. Why do you think the author chooses to open the book this way? What do you learn about Camille from her reaction to the story? “Natalie was buried in the family plot, next to a gravestone that bore her parents’ names. I know the wisdom, that no parents should see their child die…But it’s the only way to truly keep your child. Kids grow up, they forge more potent allegiances. They find a spouse or a lover. They will not be buried with you. The Keenes, however, will remain the purest form of family. Underground.” Macabre but true? “Outside on the porch I saw a changeling.” How do you feel about Amma? Is she a changeling in the traditional sense of the word? Or a chameleon forced to adapt to her unnatural environment? “When you die, you become perfect. I’d be like Princess Diana. Everyone loves her now.” Is Amma right? Does this apply in the world of Wind Gap? In our lives is this also true? 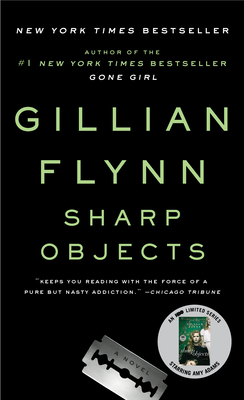 Do you think there is any significance to the letter A in Sharp Objects? Think of Camille’s family in particular. “I’m here. I don’t usually feel I am.” How has Camille’s past shaped her? Do you agree with the shrinks that her “weightlessness” is due to her ignorance of her history? “‘Oh now look what you’ve done. I’m bleeding.’ My mother held up thorn-pricked hands, and trails of deep red began to roll down her wrists.” What does this moment tell you about how Camille views her mother? About how Adora views Camille? How important do you think the outward appearance of the people in Sharp Objects is to their personalities? Ugliness and beauty are themes throughout the book, but are they the key themes? Or do the characters rise above the visual? “A ring of perfect skin.” One on Camille’s back, another on her mother’s wrist. What significance does this have? How alike are Camille and her mother? In what crucial ways are they different? “Sometimes I think illness sits inside every woman, waiting for the right moment to bloom.” How far do you agree with this? Can you see how Camille has come to think this? Female violence is a major concern of Sharp Objects. In what ways are Camille, Adora, and Amma each violent? What does the outlet for each woman’s acts of violence tell you about her personality?